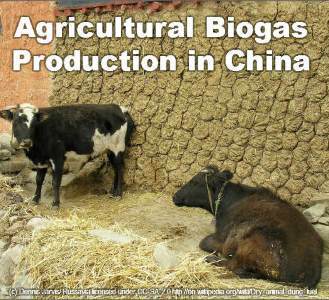 Biogas production in China from agricultural organic waste is extensively utilised already and has potential to be developed further, to provide additional energy, and this is also highly sustainable energy for the nation. Even as long ago as the end of the 19th century, there were simple biogas digesters in operation in Southern China. 1932 saw the first biogas company opening facilities in Shanghai, with plants installed along the Yangtze River and in the southern provinces. Mass adoption of biogas took off in 1975 when the party adopted the slogan “biogas for every household”. The famous Chengdu Biogas Research Institute (BIOMA) was founded in 1979 to disseminate this know-how locally, and on an international level. However, there is still plenty of room for improvements from agriculture and currently at least 580m t/a agricultural (manure) and agro-industrial biodegradable wastes and waste water are thought to be available as potential sources from which biogas can be produced to supply renewable energy in China. The agricultural production of liquid and gaseous biofuels from energy crops also holds substantial possibilities for greater biogas production in Chin in China, but is naturally controversial due to its potential to compete with food production and raise the cost of basic food commodities. The amount by which biofuels from energy crops might contribute to renewable power in China is thought to rest at about a potential 50 to 100m t/a by 2020. Chinese authorities are giving a priority to the avoidance of GHG emissions which they appreciate does contribute to a reduction global warming. The current political structure in China is seeking to encourage the implementation of the required infrastructure jointly by local authorities, entrepreneurs and farmers. However, before this can happen substantial capacity building in the necessary process plant facilities will have to take place. China has been famous for many years for its ability to use organic wastes for biogas production on the small scale both in agriculture and within small communities. However, it is surprising that despite the success of Anaerobic digestion and biogas production in China, at the small community scale the application of the biogas technology remains still today mostly limited to decentralised and small-scale to community scale biogas digesters in rural areas in the south and south-west of China. There is restricted experience with large-scale applications of anaerobic digestion/biogas production methods, and especially in those technologies appropriate to the cooler climates of northern China. Just a few middle and large-scale plants were built in the period since the mid-1970s, mainly motivated by rural environmental protection requirements, and biogas only considered to be a by-product. Nowadays, under renewable energy legislation recently introduced, the targets are changing to energy production as the primary purpose for these plants. (1) ‘Circular Economy Policy inspired by Japanese and German Recycling Economy Laws and its targets till 2020, based on the ‘Cleaner Production Promotion LaW (2002) by NDRC and SEPA, including a ‘Life Cycle Assessment’ approach. (2) ‘The Renewable Energy LaW by NDRC, effective from 2006, is a framework policy, which lays out the general conditions for renewable energy to become a more important energy source, and supports various types of grid-connected renewable power generation. It includes wind, solar, water, biomass, geothermal and ocean energy. Obligations and prices are defined which enable the feed-in-grid of renewable energy into the existing power, gas or heat grids. (3) ‘National 11th 5-Year Plan’ from 2006 till 2010, aims to – increase the treatment ratio of MSW after collection from 53.5% in 2005 to 60%, which implies a capacity increase from 80m t/a to 120m t/a, till 2010, support the electricity generation from landfill gas and on the other hand set energy efficiency targets, such as to limit energy consumption per industrial output value and to promote energy saving measures. (4) ‘China’s National Rural Biogas Construction Plan’, BCP by MOA (2003), has been targeting operating 15m household biogas plants (using locally self generated organic waste) by 2006, and is planned to go on to make (with 23m units in place) 20% of the all China’s farmers, biogas users by 2010. (5) ‘Minimization of Environmental Pollution from Livestock Breeding Waste’, a SEPA policy (1999) driven by the severe polluting impacts being experienced on water bodies from diffuse pollution from intensive animal farming (Xiaoyan WANG). (6) ‘Construction of New Socialist Countryside’ national policy, 2006 to boost modern agriculture, infrastructure, pubic services and the farmers’ income till 2010. All the above-mentioned policies are supporting the development of an integrated bio-organic waste management scheme in China in compliance with the renewable energy production allocated within the 11th 5-Year Plan, which runs until 2010, and the long-term targets planned through to 2020 and 2050. So everything considered, China will continue to become an ever larger biogas producer and renewable power user. “Thanks for sharing, this is a beneficial post. No longer am I puzzled about this alternative energy technique”. What is the abandonment rate for digester projects in China? If anyone has data, I am looking for the data. There are many AD plants which have been built now, but the acid test would be how many are still working after 5 or 10 years?